It's a wet Friday morning and I'm taking a little while to get started, unlike the star of this wee fan video, who manages to go from poopy-pants to shell-head in a just few seconds. Offing a fair few stuffed rabbits (who resemble the major icon of Disney/Marvel's major rival) in the process. 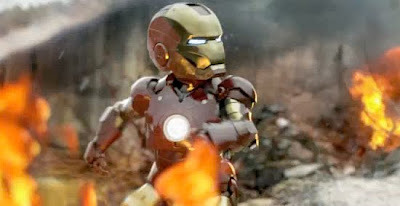 A nicely produced little number by Patrick Boivin, starring his own little girl, in an 'iron suit' by her uncle at STROB.net, you can check it out below, while I go source some caffine and recover from using the term 'poopy-pants' in a blog post.